This creative climb joins two of the most scenic routes up Mount Kenya, Sirimon and Chogoria, producing a remarkably diverse and spectacular trek. Sirimon coming off the west of Mount Kenya passes through the dry side of the mountain with its giant trees and rocky terrain, and the descent onto the Chogoria path is exactly different with its lush bamboo and highland forests. The final night time ascent of Point Lenana can be as difficult as any ascent in East Africa, but the rest of the trek is generally considered easier than either Kilimanjaro or the Rwenzoris, and this is the most likely climb for actually seeing big game. Accommodation on this hike is in mountain huts. Nonetheless, if you prefer to camp you can do so on all nights on the mountain. Day 1: Nairobi – Sirimon gate- Old Moses camp. ( 3,300m) 3-4 hrs, 9km, 680 ascent. After pick up in Nairobi,drive to Nanyuki town for lunch crossing the equator en route to the Sirimon Park gate (2660m). From the gate, we trek up thro magnificent montane forest, bamboo and giant heather zone before reaching the high altitude moorland and our first hut (Old Moses camp 3,300m) for dinner and overnight.This is a gentle trek that takes 3 – 4 hrs gaining an elevation of 680m. After breakfast, follow the track uphill, forking right at the junction. After a water break, you continue on the track crossing Ontulili River before turning right contouring through the Moorland and crossing Liki North River and continue uphill to Mackinders Valley from where there are panoramic views up the valley towards the Shipton Camp.This camp is a surreal setting below the towering peaks and glacier. Resident population is of Rock hyrax and sun birds. For better acclimatization you can take a rest day at the Shipton camp. Short walks / day hikes are possible on the summit climb to Oblong and Hausberg tarns gaining an elevation of 370m before returning to the camp for lunch. Afternoon is at leisure. N.B: Climbing high and sleeping low is excellent for acclimatization – but you can do that almost as well toughing in the sun watching the eagles! 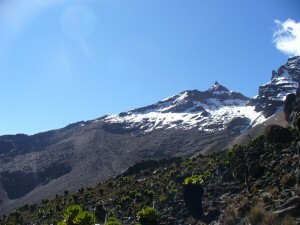 Day 4: Shipton – Point Lenana(4,985m)- Mt Kenya Bandas (2,900m) 11-12 hrs, 785 ascent, 2,085 descent. Kick off at 3.am to reach point Lenana in time for the African Sunrise. The climb starts on frozen scree and continues on a rocky track with some very minor scrambling. with a good moon you barely need a torch. Without a Moon then the pollution-free sky bangs on the ground giving you as goog a view of the Stars as almost anywhere on Earth. Descend to Minto`s hut for full breakfast. After a short rest descend further to Mt Kenya Bandas along the Gorges valley where you can enjoy good views of the Temple, Lake Michaelson, Mushroom rocks and Giants billiards table Mountain. Dinner and overnight at the Mt Kenya Bandas. Here can enjoy log fires, hot showers and bed at the Bandas. After breakfast, descend on a broad track through bamboo and virgin rain forest to meet vehicle for transfer to Chogoria town and further to Nairobi arriving by 17:00hrs. Accommodation in mountain huts/ camping where applicable.